Well, the Moulton finally showed up about a month ago. What should have a been a 6 week wait became nearly 6 months. I won’t go into the details except to say it wasn’t the fault of the dealer I bought it from. Anyways, this post is sort of a ‘first impressions’ review…. I got the bike through Bruce Metras, a Moulton dealer in the SF area. Bruce is very well versed in these bikes, and has the little bit of specialized knowledge these bikes occasionally demand. Upon un-boxing my first impression was that it’s quite a lovely machine and very well made. First ride impressions were great. It actually fits and feels like a regular bike in a lot of respects. I have the fit adjusted to nearly exactly match my steel Spectrum road bike (within about +/- about 5 mm on setback and reach). Further comparing those two on the road, I found the Moulton climbs seated as well as my Spectrum. Standing is slightly annoying because of suspension bob. You have to modify your riding technique slightly to minimize the bobbing. Lower cadence and rocking the bike a little bit more. Between that and getting the spring rate and damping adjusted right, it’s now mostly a non-issue. The TSR has the ‘unified rear triangle’ design that prevents any pedaling force from actuating the rear suspension, but even when pedaling over bumps I don’t really notice the BB moving back and forth (although it is). 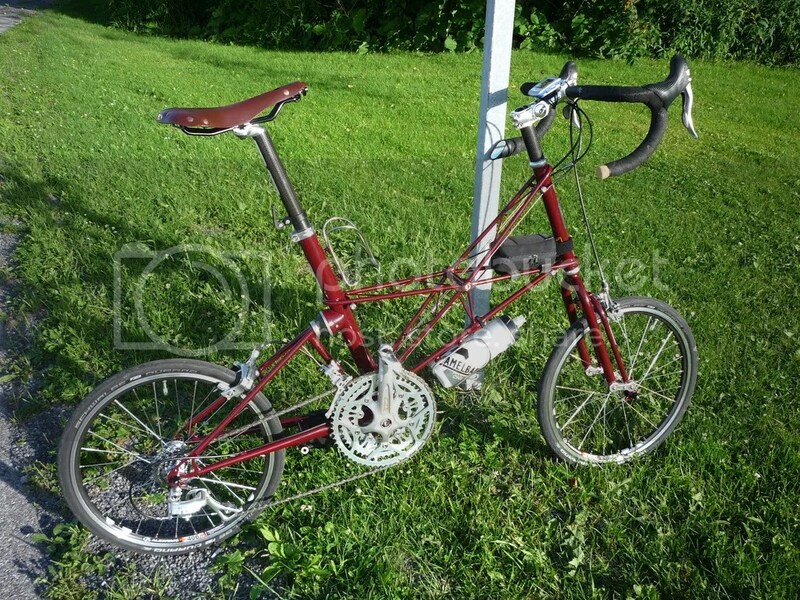 The Moulton feels great at high speed. Very stable and secure. I wasn’t really expecting that. I’ve had it up to about 45 mph so far. 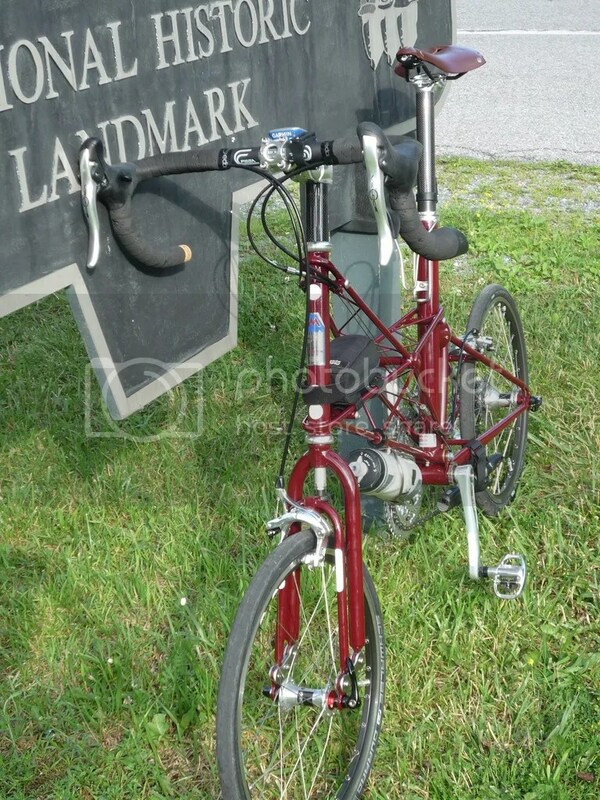 The most notable thing about the bike is that it’s just simply a fun bike to ride. It sure feels different than a big wheeled bike. Not recumbent level different, but perhaps splitting that difference. The suspension is quite effective. I am genuinely surprised that it more than makes up for the 28-406 Duranos pumped up to 100 psi. The Moulton rides softer than my 28-622 wheeled Spectrum (with Clement LLG tires) over the same roads. On chipseal, specifically, there is not as much difference in ride quality, but over potholes, manhole lids and the like, the Moulton is much softer. Where I need to lighten up on the saddle on the Spectrum, I can stay fully planted on the Moulton and just ride it out. It’s way cool. Also, in the handling department, this bike corners with notable enthusiasm. The bike seems to want to take every corner all out, with confidence. The only thing about the bike that does NOT inspire confidence in the ride is any loose gravel you might expect. The small wheels definitely do not feel as secure in those conditions. Overall, I am really happy with the bike. Time will tell if it becomes my preferred ride or not. I am already well on my way into doing mods and upgrades. I just can’t leave well enough alone. The Durano’s have been shelved in favor of some Panaracer Minit Lites. The adjustable stem is going soon. And I’ve discovered I don’t like compact bars and some Noodles are in my future (to match the Spectrum too). Here are some pics from what I think was the 2nd or 3rd ride. Nice color in the sunshine. Officially it’s called ‘Burgundy’ but I think of it as ‘California zinfandel’. Wow, I love the color! Congratulations on New Bike Day! Interested to hear about how it rides after you’ve had time to put some more miles on it.